I realized very quickly the base needed re-chroming, but I didn’t want to pull it all apart and have it sitting as parts in a box for weeks while the base was being redone, I wanted to use it. As an additional thought on that issue, as busy as I can get, if a project sits in a box it often does just that…for a while. 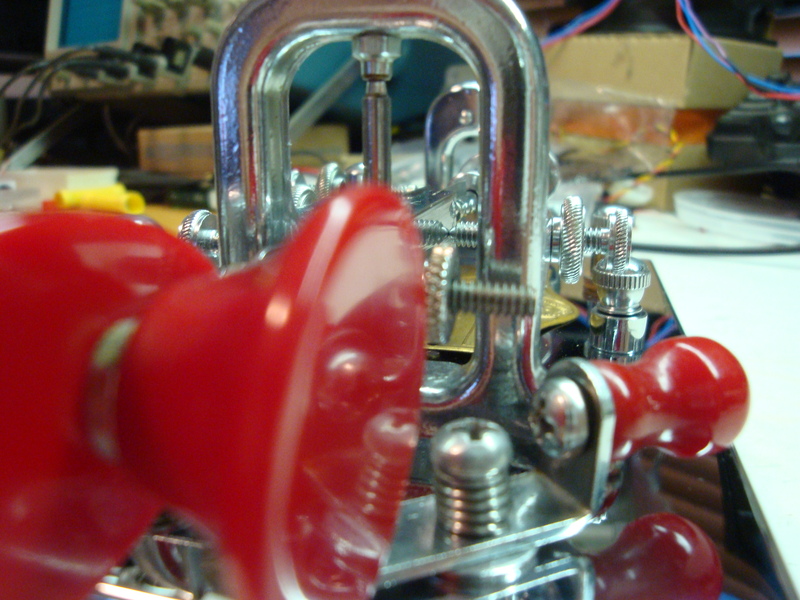 Bottom line: I bought a new base from Vibroplex. I’ll have the original “Original” base re-chromed eventually…maybe. 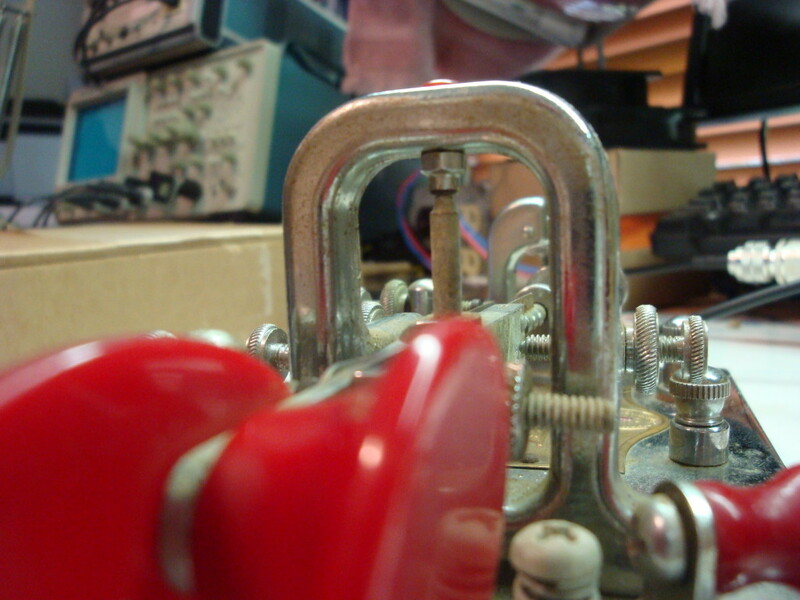 Some notes about getting a replacement base from Vibroplex: The quality is pretty good, but the base does not have the #8-32 tapped hole for the tuning switch assy. and I had to layout, drill and tap one. Also, the holes for all of the electrical contact posts are smaller than are the original, so the original fiber insulating shoulder bushings will not fit. You should buy the Vibroplex replacement bushings when you order the base. In addition, the holes pre-drilled for the Vibroplex label are the wrong diameter and in the incorrect place, at least for this 1957 vintage label. I don’t know when this was changed, but at least on my bug I had to drill two #50 holes (0.070″) in the old positions to mount the label. 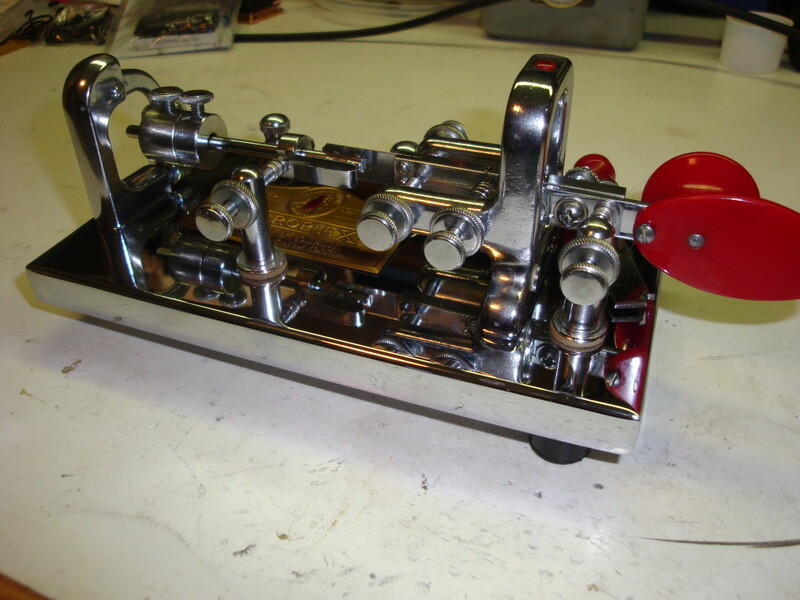 I looked on line for Vibroplex restoration details and found W.R.Smith’s site, so I bought his book and polish. The book is very informative and reflects many years of experience, especially with the older pre-WWII Bugs. The polish does indeed work well, it’s formulation seems similar to another metal polish I have used with one big difference: the base fluidizing agent is oil, not water. As a result it stays liquid and doesn’t evaporate, so you can stay polishing longer. This is a great advantage if it is needed. One down side is the oily film it leaves, which as he states can be removed with baking powder or corn starch. One way or the other it is not a big issue. A anyone who has refinished anything from an old car to old furniture knows: prep work prior to putting a new finish on is the key (CW pun intended). I used a Dremel tool with various buffs and the W.R. Smith polish on everything and got great results. On many pieces the finish wore through before the pits or tarnish was gone. 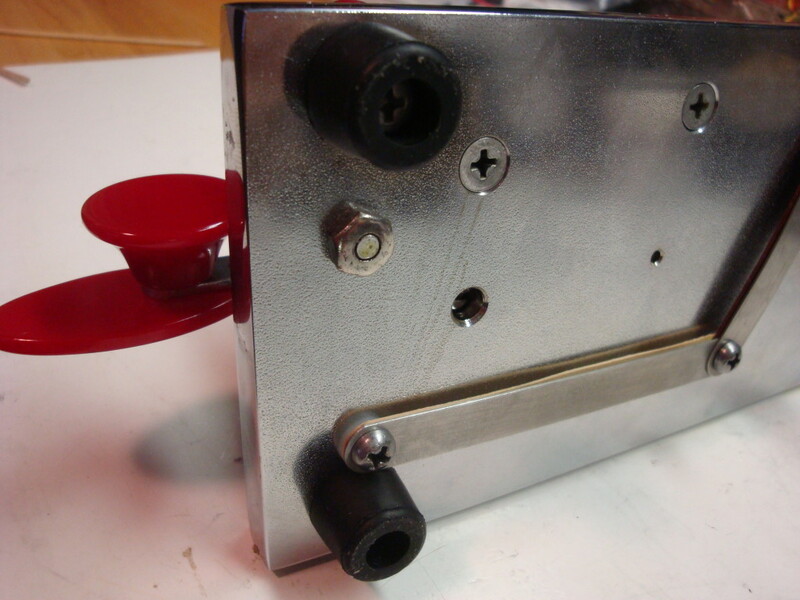 I selectively plated pendulum parts and washers with nickel, and the electrical connecting straps on the bottom with a tin/zinc plate. I wanted the project to only take the one day, so I intentionally left a few parts in less-than-perfect, but looking-very-good condition. I wanted to use all of the original hardware, as it is part of the look of the unit, and a lot of it was cadmium plated. After some years, the cadmium plating will combine with atmospheric sulfur to form CdS, Cadmium Sulfide., which gives the hardware a dusty yellow-green finish. If you buff this CdS film hard enough it will come off…but it is not a good idea to breathe the resulting CdS dust, plus the appearance with the cadmium removed is incorrect and the hardware will rust. I decided to research a different procedure. There are various acidic urea compounds which are commonly used to convert silver sulfide (Ag2S) back to metallic silver, releasing an awful-smelling sulfurous gas in the process. One such compound which is readily available is Tarn-X. I was able to use this product successfully to reconvert the CdS to metallic cadmium with a lot of elbow grease and q-tips. So in general, all tarnished parts were polished with a Dremel tool and buffs using W.R. Smith’s polish (highly recommended). Afterward they were assessed to see if they needed replating. Parts which were chromed initially were re-plated with nickel, which when polished and protected has a similar spectral reflectance. A quart of nickel plating solution (nickel sulfamate + acidic buffer and surfactant) is currently available from Krohn for $22 on eBay. Other parts for which a more flexible film was desired and which were not subject to wear were plated with a tin/zinc solution available from Eastwood. I would love to have the time to have done a perfect restoration as W.R.Smith performs so beautifully. In my case time was short, and the few parts I polished which still had imperfections were acceptable to me, I made sure they had a coating of polish to retard further corrosion. The restored bug operates beautifully, and I refuse to answer any comments as to why I have the weights set for such a slow rate. The answer is twofold: although most bugs come with a 0.013-0.015″ thick mainspring, this particular bug came with a 0.018″ thick mainspring which gives it a minimum speed with the weights shown of ~25WPM. Also, and in advance to these naysayers (you know who you are, Jack): switching back and forth between a semi and fully automatic keyer takes a while to learn. Even for someone like me who learned how to send at 35WPM with a bug many years ago, before I built my first iambic keyer (using RTL logic ICs, built into a Ten-Tec magnetic keyer case, but that is another tale…). Thanks for sharing your restoration journey. I also restore bugs as a hobby. You can find some of my finished projects in my shop on Etsy, called “RobsHobbies”. I’m always looking for ideas for overcoming some of the technical hurdles of getting that showroom finish back on these old keys. I have been reluctant to do the plating myself. I have found a company that will re chrome the bases for me, but they charge a lot for their service, so I am selective on which ones I am willing to pay the extra cost to have a fresh coating of chrome. You did a beautiful job on that 1957. If you take on any more projects like that one, I hope you will share the story and photos. I love to see new life breathed into these old machines! I appreciate the comments, and I am enjoying making a mess of CW with that bug! Although I learned on a bug, after 40 years of iambic paddles, I am having a devil of a time switching back and forth between them! You have some really nice items in your Etsy store! Great work cleaning them up! I wonder if Etsy would be a good place for me to sell…? 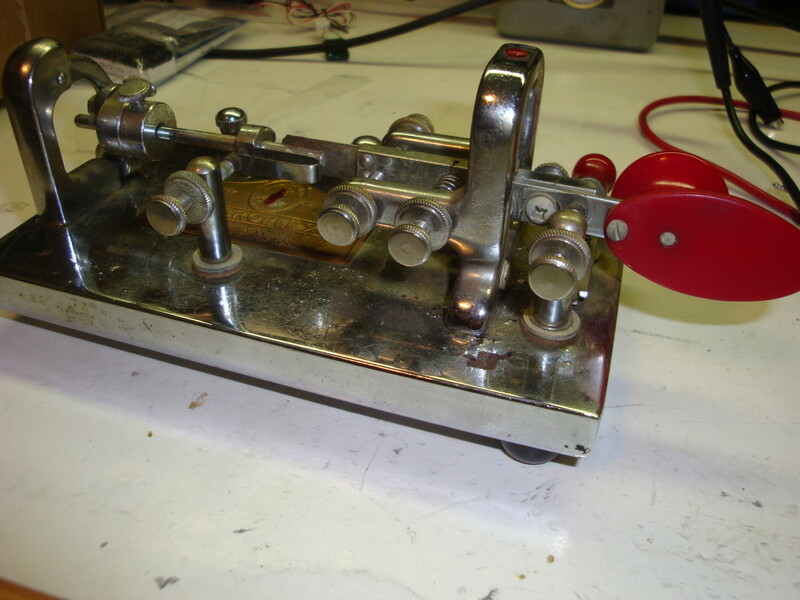 Just came across your post on restoring the Vibroplex Original Bug. I have a 1964 Champion and a late 60’s Original Bug. Both are FB keys. You did a very nice job restoring the old key. I have a bid in on EBay for a 1944 Zephyr that’s in pretty fair condition. If I’m successful on the bid, I would like to restore the key. It appears to be in good working condition, but does have some light oxidation and rust here and there. I would like to put the key in excellent condition if possible. I have no experience with plating metals, but am willing to give it a go. I have done a little bluing, but that’s about it! 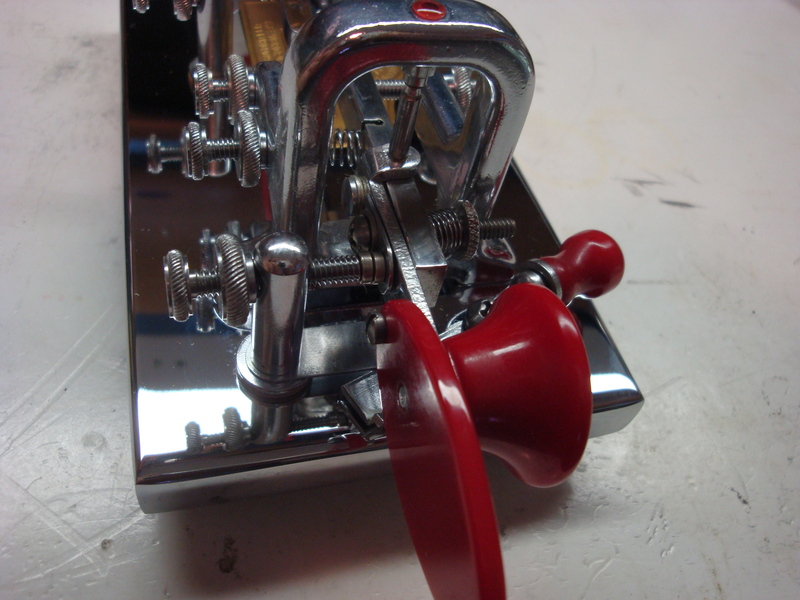 Anyway, thanks for the great article on restoring your key and hope to see you on the bands someday! I wish you lots of fun restoring that bug, it is an enjoyable way to pass the time, and the results can be very gratifying! 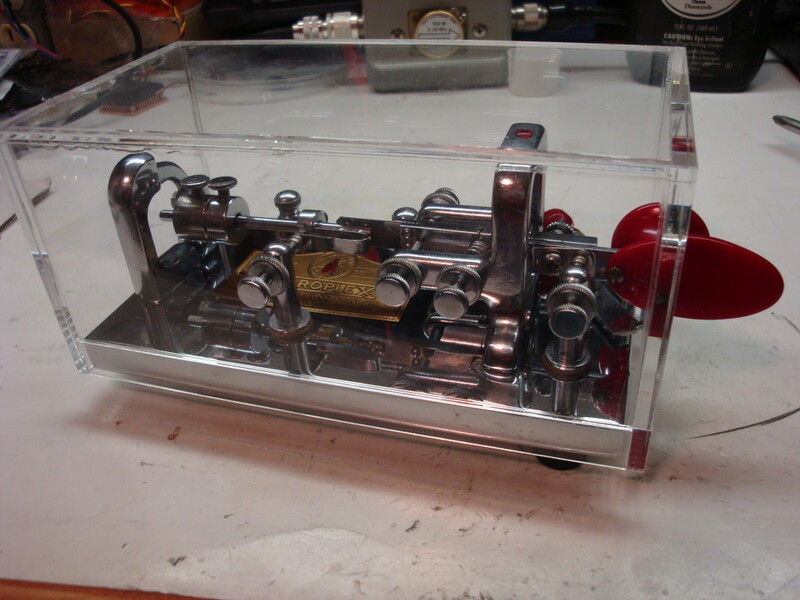 You did a nice restoration job on the old 1957 Vibroplex Original Deluxe. There is something really rewarding restoring these old bugs to as near as like new condition. Thanks for the comment, and info about the nameplate. It is great to be using a bug that you yourself restored for sure! Thanks for publishing the photos and process of restoring your bug. I have several bugs here in varying degrees of need (for restoration), but no experience with plating or other chemistry methods, except for etching circuit boards with ferric chloride. I will get some Tarn-X and look into the Eastwood product. One question: how do you remove the serial number nameplate without bending or damaging it ? 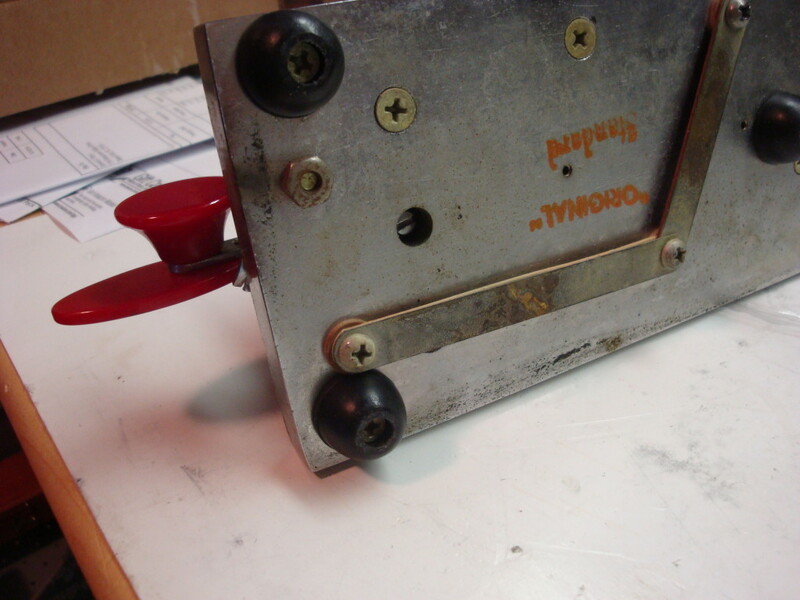 With the chemicals available on eBay, nickel or the Eastwood tin plating are pretty easy to do, and the results can be very good if one remembers that the plating is so thin the surface prep before plating is what determines the final appearance. The plating just makes the color even. On my bug I removed the nameplate by driving the spiral nails out with a small nail inserted in the hole in the bottom of each nail. 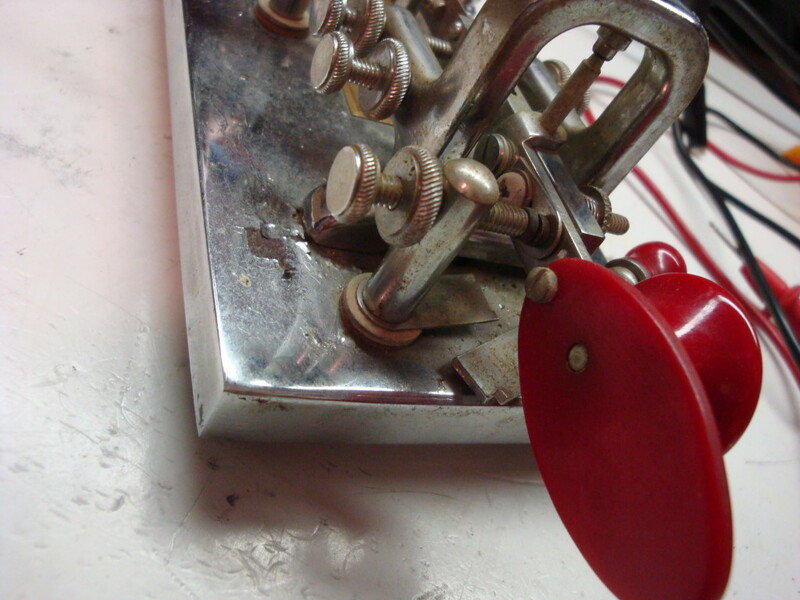 I also enjoy refurbishing old Vibroplex Keys, mainly the Vibrokeyers which I have about 6 at this time. I really enjoyed your article and it turned out just beautiful. It is so gratifying to me to bring these keys back to life and get them in the hands of good Morse operators to once again hear the sweet music they make on the air. Again GREAT work my friend.